The Navy’s sophisticated F-35C stealth fighter has completed its final system development and demonstration flight and is poised for full production, the Navy announced Thursday. “Since the first flight of AA-1 in 2006, the developmental flight test program has operated for more than 11 years mishap-free, conducting more than 9,200 sorties, accumulating over 17,000 flight hours, and executing more than 65,000 test points to verify the design, durability, software, sensors, weapons capability and performance for all three F-35 variants,” he added. The final flight occurred Wednesday at Naval Air Station Patuxent River in Maryland, when Navy test aircraft CF-2 completed a mission to collect loads data while carrying external 2,000-pound GBU-31 Joint Direct Attack Munitions and AIM-9X Sidewinder heat-seeking missles. 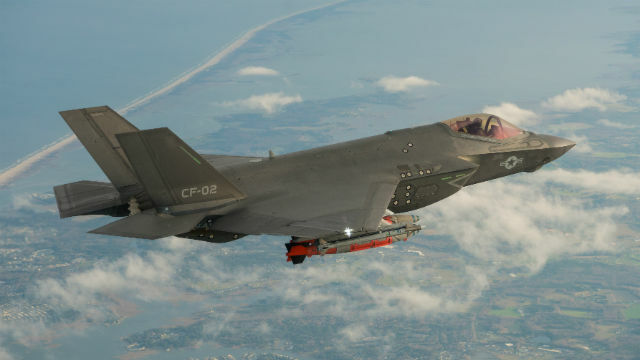 The F-35 Lightning II is being built in three variants for the Navy, Air Force and Marines in the largest weapons program in history. The program now awaits a Department of Defense decision to go into full-rate aircraft production.